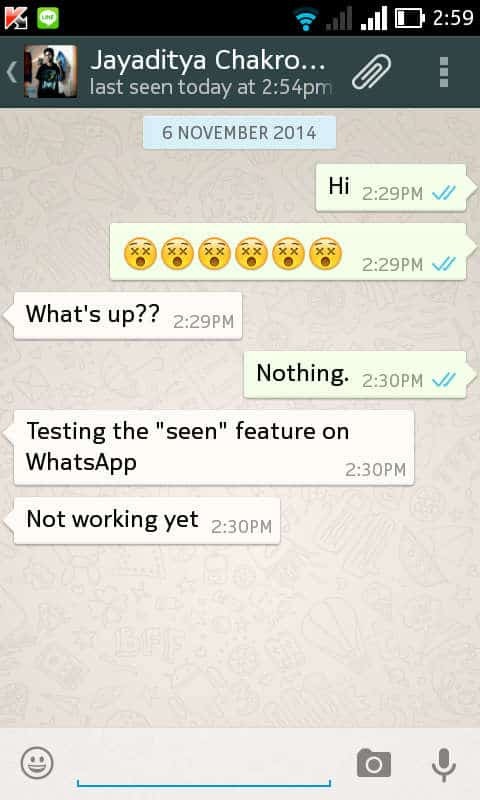 Another new featured added to WhatsApp, and with that be sure to have a break up if you are in a relationship. If you are an IM freak and regularly use WhatsApp, from today onward you will see a useful change in the app, however, the change is very small and many people won’t even notice properly but the feature is as useful as destructive. I will tell you why. Earlier, people used to have a lot of doubt regarding the single tick and double tick on WhatsApp whenever they sent a message. Most people thought at first that the double tick says that the message has been read. But actually, at that time the single tick meant that your message has reached to WhatsApp servers and the double tick denoted that the message has been delivered. Now whenever you send a message to anyone in your contacts you will see a blue double tick, which means that the message has been read. Alternatively, you can long press on a message to access a ‘Message Info‘ screen, detailing the times when the message was received, read or played, but the blue ticks will help you when you are chatting continuously. The updated FAQ confirms this. Also, another website leaked some screenshots which point that WhatsApp may be bringing up its VoIP feature soon and support voice calling.